FRIDAY morning, August 1, 2008 and word filters through to Limerick that there had been a successful summit of K2. Damien O’Brien, the brother-in-law of Kilcornan’s most famous son Ger, is reflecting on the events that took the life of the climber on K2 a decade ago. It eventually took Ger’s family months to piece together the evidence that would tell the story of how he died. Damien, married to Ger’s sister Denise, penned a book called The Time Has Come: Ger McDonnell - His Life and His Death on K2. The family has also organised a charity cycle every year since his death, and this July 21, the tenth cycle and fun day will take place. It will also be the last. For Damien, the death “only feels like a few years” ago. This August 2 marks Ger’s tenth anniversary. “The ‘unknown status’ went on through Friday night. I still remember it, the smell of coffee when I walked down the stairs on the Saturday morning. Denise had still not gone away from the computer,” he says. Ger had been in an accident on K2 two years earlier, when he first attempted the world’s deadliest mountain. Caught in a rock fall, his helmet saved him. “He survived before, so we had hope,” said Damien. “But we were getting a bad feeling at that stage, and all Saturday and all Saturday night we watched it. We decided to move up to Martha’s house [one of Ger’s other sisters]. We were all in her kitchen, with about three laptops going, pressing the refresh button. And as the world woke that Sunday morning, the news broke. “The press had the story that Ger was gone, there were different and conflicting stories in the papers. At Mass in Kilcornan, there were journalists going to the church, to the priest, to try and meet people to talk about Ger. We went to the priest that morning, to say to him that we were fairly sure that Ger was dead,” said Damien. Family members flew out to Islamabad to talk to the other climbers and try to discover what happened to Ger. “It wasn’t as smooth as it should have been at the start, because there were so many conflicting stories coming off the mountain. JJ (Ger’s brother) made the decision, he said ‘right, we’re going out to Pakistan, we’re going to get his gear and talk to some of the guys before they go home’. “Pemba (Gyalje) was the last climber that we met, and little did we know that he was the most crucial part of the jigsaw, because he took pictures of what was happening. When you zoom in you can see what’s actually going on, you can see where the different bodies are, you can see the three guys hanging upside down and a guy in a red suit, which we know now was Ger - we had accounted for everyone else on the mountain - helping the three lads,” said Damien. Ger died after an avalanche. He had stayed behind to help three other climbers. “Myself, JJ and Denise, I remember we sat down at our kitchen table, and we spent hours and days, going back over pictures, reading stories, trying to piece everything together. For his family, it was all about getting the truth out,” says Damien. When Ger McDonnell died, this reporter was a student at his old school, Coláiste Mhuire in Askeaton. That autumn, a photograph was erected of a hero who died while helping others, a role model for the students who followed him through the same school. Since his death, many tributes have been paid to a modest man who would probably have been embarrassed by the fame. A mountain in Greenland has been named McDonnell Peak, a DCU scholarship fund was founded, and the sports facility in Kilcornan is now called McDonnell Park. This month, a Donegal man named Jason Black, who is currently attempting to become the second Irish man to reach the K2 summit, erected a plaque on the mountain in memory of Ger. 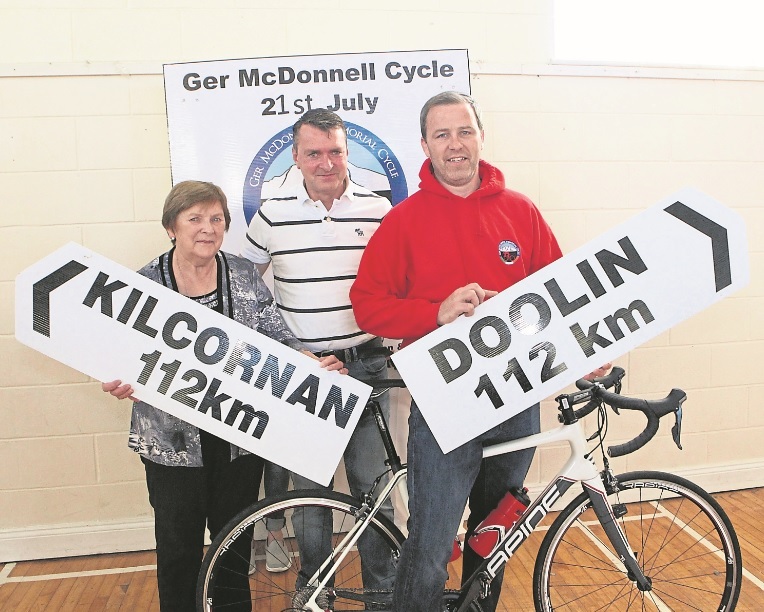 And the annual cycle in memory of Ger is about to spin from Doolin to Kilcornan for the last time on July 21. Thousands have been raised for charitable causes each year. “Instead of it just fading away, we just wanted it to close at year 10,” said Damien. A big family fun day will greet the arriving cyclists in Kilcornan this year, with music and entertainment for all ages. For more information on the day’s events, to register for the cycle or to donate items for sale on the day, see ‘Ger McDonnell Cycle 2018’ on Facebook.